Time travel is one of those fun and intriguing concepts that has found its way into every movie genre. Obviously there is time travel in science fiction films, but it can also be found in the horror, action, drama, comedy, and even romance genres. So there’s an apparent attraction to the idea of time travel and its been explored in a variety of different ways. Therefore the real challenge for a filmmaker is to take this familiar subject and give us something new and fresh – something we haven’t seen before. I’m thrilled to say that’s exactly what writer and director Rian Johnson has done with his mind bending sci-fi action film “Looper”. As you can guess, “Looper” takes place in the not-to-distant future. Time travel has been realized but by the year 2074 it has been outlawed. The crime syndicates illegally use time travel as a means of executing and disposing of targets, something that has grown increasingly difficult to do in their time. That’s where loopers come in. They are mob killers who execute the targets sent from the future, collect the silver bars sent with the target as their reward, and then dispose of the bodies – no mess and no connections to the mob. 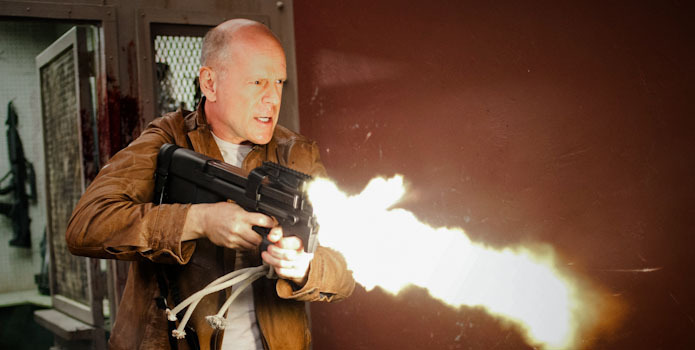 Loopers operate out of Kansas City in the year 2044 and are headed by a mobster named Abe (Jeff Daniels). In fact, we learn that Abe is essentially running the entire city. Joseph Simmons (Joseph Gordon-Levitt) is one of Abe’s most trusted loopers. He’s efficient and by-the-books. But soon Joe is faced with what’s called “closing the loop” – the syndicate’s version of retirement. You see, the looper will be sent the future version of the himself to be executed. No party or shiny plaque. Just a hefty payment in gold bars and a release from their contract. “Good-bye” and enjoy the next 30 years. As we hear in the movie, the looper job doesn’t attract the most forward thinking people. Joe is surprised and unprepared when his latest target turns out to be himself only 30-years older and bald (Bruce Willis). He makes the biggest mistake a looper can make – he hesitates and old Joe jumps him, knocks him out, and then escapes. Soon young Joe has the mob hot on his trail as he’s trying to “make things right” by catching up with and killing old Joe. But old Joe has a mission of his own which really turns everything on its head. The first half of the movie focuses more on the loopers, on introducing us to Johnson’s world, and setting up Gordon-Levitt’s character. A huge part of any movie like this, especially when dealing with time travel, is creating a believability to what you’re presenting. In other words, we need to buy into what we’re being shown. The concept behind this Rian Johnson futuristic concoction is brilliant and a breath of fresh cinematic air. What’s even more impressive is how well it’s realized on screen. He doesn’t overdo his futuristic landscape so I never felt too disconnected from this world. But there is some cool technology and Johnson clearly has fun with some of it including his ugly green energy dependent cars and the bad cell phone reception. But the city itself is a dirty and unpleasant place filled with poverty and drug use – just what you would expect from a mob-led city. The second half of the movie takes a slight change in direction. Much of it takes part on a farm outside of town owned by a single mother Sara (Emily Blunt who exchanges her English accent for a country girl one) and her son Cid (Pierce Gagnon). Young Joe’s search for old Joe leads him to the farm where he hopes to find shelter from the syndicate and clues to what his older self is up to. But he quickly learns that there’s more to this farm family than meets the eye. These scenes add some authentic emotional punch to the film. But Johnson also uses this part of the movie to open up several new doors which add more and more layers to the already challenging story. Of course there were a couple of times where I had to stop and process what I had just seen, but I really liked these different directions and as a whole, the complex yet miraculously cohesive script is constructed with such intelligence and precision so that I never felt lost nor did I feel the material ever bogged down. It’s also worth mentioning the spectacular visuals and no-holds-barred action sequences. It doesn’t take long to recognize Johnson’s skill with framing shots and moving his camera. He uses several unconventional techniques which give the move a unique look. We get several close-ups where Johnson wants the expressions of his characters to tell the story. He also often times places his camera at ground level giving us the feeling we are looking up at them. This is very effective particularly during the buildup to a couple of key action scenes. Speaking of the action, it is incredibly done. It’s a brutal and violent mix of sci-fi and 1980’s gun-blazing action and both work extremely well. Johnson doesn’t skimp on the blood but it feels right at home in this picture. I also have to talk about the acting. 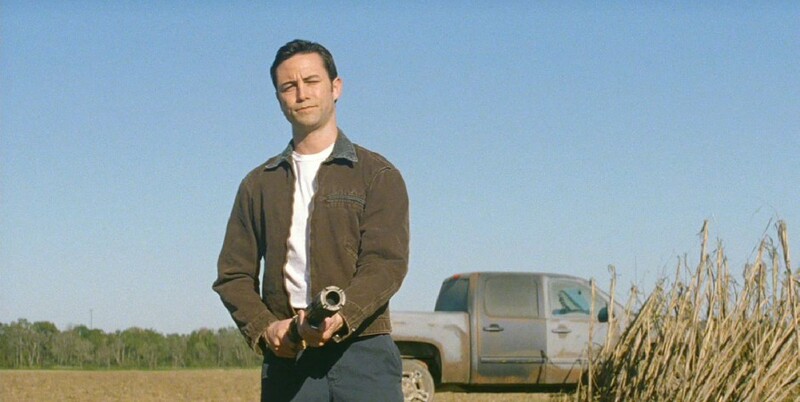 The performances in “Looper” are solid throughout with some being Oscar caliber in my opinion. Joseph Gordon-Levitt continues to prove that he’s a top Hollywood talent. Here he’s armed with heavy makeup, a prosthetic nose, and a Bruce Willis smirk. The funny thing is he channels Willis perfectly from his slouch to his expressions, all while giving a very different performance than Willis. And speaking of Willis, he is excellent here. What stood out was the range that he shows in this performance. For instance there are scenes where he’s a cranky codger, an emotional wreck, and laugh out loud funny. But there were also scenes that reminded me of John McClane from Die Hard – steadily yelling while his machine gun pumps loads of lead. Emily Blunt is fantastic as always, Jeff Daniels just eats up his lines, and Paul Dano plays the same measly, wormy character that he always plays. Then there is young Pierce Gagnon who is phenomenal. He’s such a tender presence but his performance goes well beyond that standard cute kid role. He’s given a lot to do and he really stands out. I’m sure it’s obvious by now that I really liked “Looper”. But it’s not a perfect movie. While the story is intensely original and thoroughly engaging, there are a few plot holes as well as some pointless throw away scenes in the first half of the movie. For example early on we see young Joe has a relationship with a prostitute. He appears to be quite fond of her even though she’s only in a couple of scenes, one of which seems to be there strictly to add some pointless content to the film. This time could have been spent better elsewhere. I also couldn’t help but ask the question – what type of crime organization would actually hire Paul Dano’s character to be a looper? His performance is fine but I had a hard time believing in him. That said, he did provide us with one of the films very best sequences. I’ll just leave it at that. 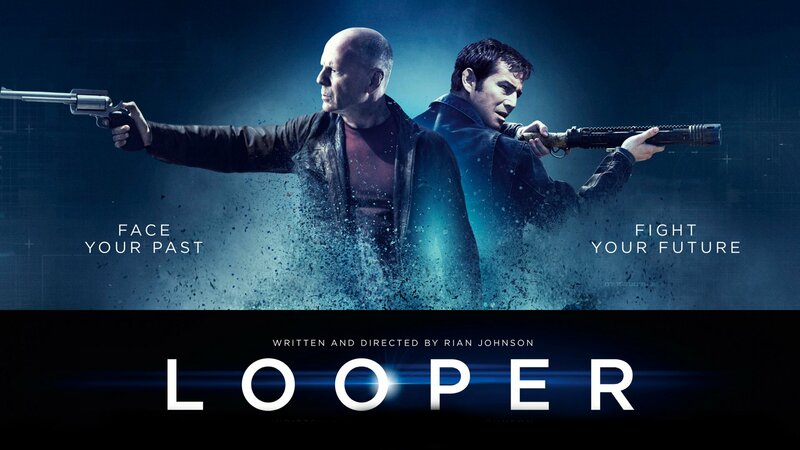 I could go on and on about “Looper” but let me just sum it up by saying that it’s the most ambitious and imaginative movie I’ve seen all year. It’s smart and audacious and Rian Johnson actually pulls it all off. It’s completely unpredictable and no matter how hard you try, you never catch up with it. It’s always one step ahead of you. “Looper” takes the familiar device of time travel to new places through a brilliantly original concept. Johnson lays out that concept clearly for the audience. Then he takes it, shakes it, twists it, and contorts it and then challenges the audience to keep up. He dabbles in different genres and themes, examines societies, questions morality, and asks us to take it all in and process it. That’s something I’m happy to do especially when the movie is this good. This entry was posted in Movie Polls, Movie Reviews - L and tagged bruce willis, emily blunt, joseph gordon-levitt, looper, looper review, movie review, movies, paul dano, rian johnson, science fiction, time travel. Bookmark the permalink. Ya know its funny, there’s that one gun fight (you know the one) where I asked myself if Willis was going to yell that – sort of a wink at Die Hard and the 80s action genre from Rian. It was so similar. Thanks for reading and I’m anxious to check out your review. Great review Keith, glad you liked it as much as I did! Thanks! It’s certainly a mind-bender and I do love mind benders! Great review, Keith! I can’t wait for Looper to come out over here. Every review is glowing. Thanks man! Trust me, you’ll love it. Great review Keith. I’m eager to see this as Johnson’s films always have that little bit extra. It’s also a genre I can’t get enough of. Thanks. It’s a mindbending sci-fi film that plays around with several different genres. Very smart, well paced, and a bloody splash of action. And of course it had the lovely Emily Blunt as well! Thanks man. I can understand your take. It really worked me with the exception of some wasted time early in the movie. I think Johnson took a lot of risks and for me it paid off. But he did leave himself open for some reasonable criticism. Solid review. Nodding along with pretty much everything you said. I think I’m getting soft. I saw the small plot holes, but shrugged them off. The film looked stunning. I was floored by JGL’s channelling of Willis in his speech and it went somewhere I never would have expected. Solid sci-fi flick right here. You’re 100% right. I never figured out where Johnson was going. He stayed ahead of me all the way. And I agree, the visuals were stunning. I can’t wait to see this again. Bravo! I, too, kept nodding in agreement as I read your review. Glad that you brought out Willis’ range in his performance here. man, what a great movie. and you give it a great review! Hey thanks! I really appreciate it. A lot impressed me about Looper and I’m anxious to see it again. It’s challenging & it gives you plenty to process. I like that from a film! Great review! I adore this movie and it’s funny you review it because I’ve been thinking recently how I’d like to see it again. I remember I participated in a blogathon years ago about long shot Oscar nominations and I chose Piece Gagnon for it. He was incredible. Thanks! This is really interesting. Did it pop up on your feed? I actually reviewed it the week it originally came out. All I did was make some adjustments/corrections to the old review.